A wound is an injury that involves cutting, breaking, or opening of the skin and tissue of the horse so that inner tissues or bones are exposed. Puncture wounds are considered the most serious. 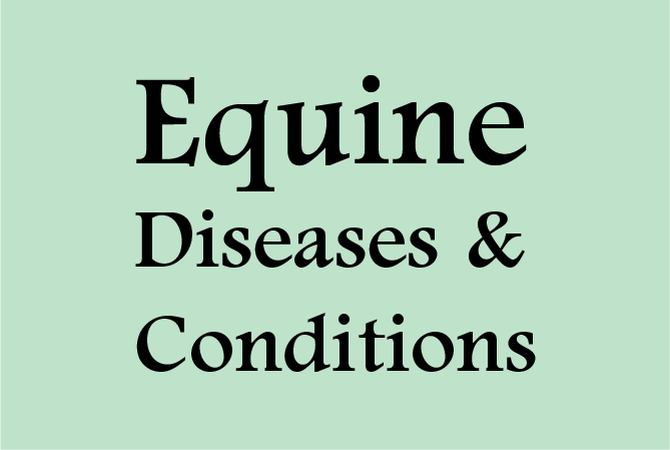 Depending on the depth, size, origin, and location on the horse's body, there is potential for the development of tetanus or other serious conditions if the wound is not thoroughly cleaned and the horse immunized. Abrasions are scrapes or friction burns to the skin of the horse, such as those caused by falls and skids. Incised wounds are made by contact with a sharp object, such as a knife, piece of glass, or a thin metal object that cuts cleanly through the skin, making treatment and care of the wound relatively easy. Lacerations are cuts that may be superficial or deep and may result in flaps of skin or tissue being torn away, exposing muscle tissue, ligaments, tendons, and bone, especially if they are near a joint. Lacerations often have rough and irregular edges and are prone to infection. Wounds are caused by the horse stepping on sharp objects or rubbing against them, colliding with fencing, barbed wire, or other stationary objects in the environment, getting stuck or caught between objects, and falling or catching a hoof when jumping or engaging in other activities. Good stable and horse management are key to preventing injuries. Clean stalls, stables, barns, riding trails, and pasture areas, where all tack and equipment are kept in their proper places, will prevent many injuries. Good riding habits will prevent horses from overexertion, which might lead to falls or other accidental injuries that cause wounds. Once a horse is wounded, any person in attendance should be ready to take action to prevent more extensive injury to the horse. If possible, the horse should be moved to a safe place. Any bleeding should be controlled and a veterinarian summoned if the wound is extensive, bleeding profusely, or if it threatens the horse's welfare in any way. All wounds are contaminated with dirt and bacteria. Proper care and handling will prevent further infection and limit the possibility of the horse contracting diseases, such as tetanus, or suffering debilitating infections. The five steps recommended in wound care by veterinarians are: skin preparation, cleansing, debridement, wound closure, and bandaging. Puncture wounds in dense muscle are less threatening than puncture wounds on the abdomen, chest, lower limbs, or foot of the horse. Any time a puncture wound occurs where it might harm the internal organs or the ability of the horse to walk or run, a veterinarian should be called to assess the extent of the damage. Because of the inherent possibility of tetanus in horses, when the vaccination schedule is either out-dated or not known, the veterinarian may recommend tetanus prophylaxis to protect the horse. Puncture wounds should be cleaned by flushing the wound with plenty of sterile saline solution. If deep, or if any debris might possibly remain in the wound, the veterinarian should determine how best to proceed. Abrasions are relatively easy to treat once it has been determined that there are no punctures, lacerations, broken bones, or other serious damage. The area should be flushed with saline solution to remove dirt, grass, or other particles, then again with a disinfectant like Betadine. Large abrasions may take several weeks to heal. The area may be hosed with cool water for pain relief and to diminish swelling, and, if the horse seems uncomfortable, a prescription for an anti-inflammatory can be obtained from the veterinarian. The area should be protected from contamination. Lacerations usually need to be treated with antibiotics to prevent infection. Any time there is a cut on the leg, it is important to pay attention to the possibility of problems with ligaments or tendons. Lacerations will need to be thoroughly cleaned. Incised wounds that have clean wound edges may need to be sutured after cleaning and making sure that there is no contamination or continued bleeding. Lacerated wounds with rough and irregular edges may need surgical debridement and, in some cases, reconstructive surgery, before the wound is closed and sutured by a veterinarian. Because of the risk of sepsis, suturing should not be done if there is any chance that the wound may become infected and inflamed. Protecting a wound by bandaging may protect the area from further contamination and aid in the healing process. Certain areas of the horse do not lend themselves to bandaging and some wounds will heal more quickly if left uncovered. Wounds on the lower limbs should be bandaged, due to the inelasticity of the skin and lack of underlying muscle tissue. Wounds in these areas are prone to develop granulation tissue known as "proud flesh." This build-up of new tissue usually keeps the wound from healing and becomes a benign, tumorous mass that may require surgical correction. Most wounds require systematic follow-up care. Guidelines from a veterinarian should be closely followed since no one schedule of procedures and follow-up care can properly address the many kinds of wounds and treatment options in today's horse world. With the vast selection of topical applications available, it can be difficult to decide what is best for wound treatment. Some compounds have questionable value, while others may be harmful. Again, the advice of a veterinarian should be sought.